Brilliant as this picture is to modern eyes it is not so startling as it appeared to Manet's contemporaries, accustomed to the masking of colour by the veil of heavy chiaroscuro. Daumier, for example, used to near-monochrome effect in painting, thought Le Fifre resembled a playing-card, the flatness and brightness of colour giving rise to his comparison. A concealed element in the design is the influence of the Japanese print which was so marked on French painting in general in the second half of the nineteenth century. It is to be traced here in the almost flat areas of colour against a plain background. Colour seems on the point of escaping from a subservient descriptive role into the dominant factor it was later to become. 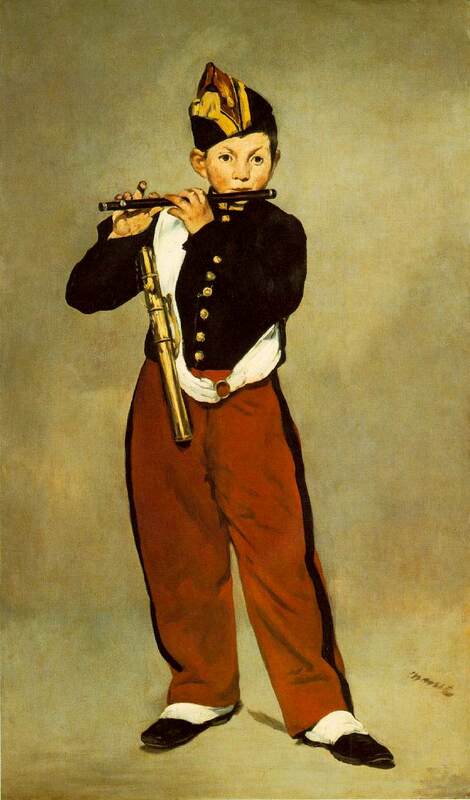 Except among the few, this picture shared the unpopularity that previous works by Manet had suffered and was refused at the Salon of 1866. 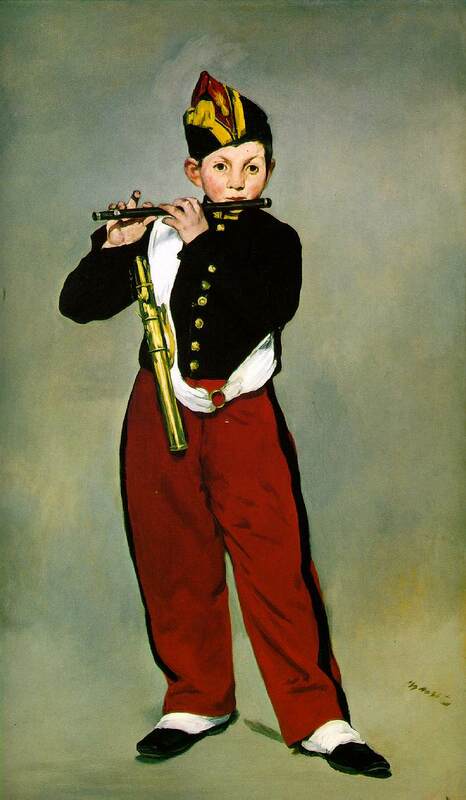 The refusal brought Emile Zola to the artist's defense in L'Evènement but Zola's assertion that he was `so convinced that M. Manet would be one of the masters of tomorrow that he would think it a good stroke of business, if he had money enough, to buy all its canvases now' infuriated the readers, and their anger caused the editor to dispense with Zola's services as critic. The novelist returned to the attack elsewhere with a longer eulogy. His description of the fifer as `le petit bonhomme' who `puffs away with all his heart and soul' was a literary approach but his polemics served to keep the issue of aesthetic freedom a living force for the younger generation.